In the application where high starting torque and constant speed are desired then synchronous induction motors can be used. It has the advantage of both synchronous and induction motors. The synchronous motor gives constant speed whereas induction motors can be started against full load torque. 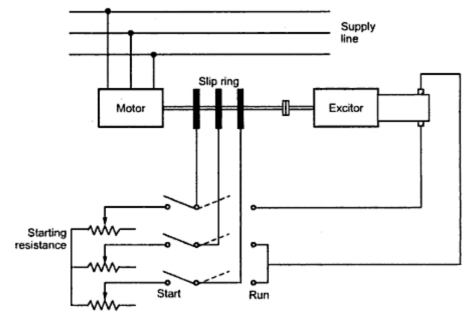 The motor is connected to the exciter which gives d.c. supply to the rotor through slip rings. One phase carries full d.c. current while the other two carries half of the full load d.c. current as they are in parallel. Due to this d.c. excitation, permanent poles (N and S) are formed on the rotor. Initially it is run as slip ring induction motor with the help of starting resistance. When the resistance is cut out the motor runs with a slip. Now the connections are changed and the exciter is connected in series with the rotor windings which will remain in the circuit permanently. As the motor is running as induction motor initially high starting torque (upto twice full load value) can be developed. When d.c. excitation is provided it is pulled into synchronism and starts running at constant speed. Thus synchronous induction motor provides constant speed, large starting torque, low starting current and power factor correction. It may be possible that the a.c. winding is put on the rotor and the d.c. excitation is provided on the stator. This simplifies control gear. It also gives better facilities for insulation which permits higher voltages and lower d.c. excitations. The d.c. winding must be designed in such a way as to give high m.m.f. with moderate d.c. excitation power. The excitation loss must be distributed evenly over the winding. The mmf distribution should be nearly sinusoidal. It should also provide damping against hunting and it should be satisfactory started as an induction motor. When the machine is running as an induction motor there are induced alternating currents in the rotor and it runs below synchronous speed. When the rotor carries d.c. currents the rotor field and hence the rotor must run at synchronous speed. This means that slip must be reduced to zero. But if there is any departure from this speed during normal operation then again induced currents are there in the rotor. The rotor is of low resistance so its windings acts as damping winding. Hence no separate damping windings are required. When direct current excitation is provided a synchronous torque is quickly set up. The magnitude of this torque is Tm sinθ where is the angle between stator and rotor field. In addition to this induction motor torque is also present which is proportional to the slip (dθ/dt), so long as slip is small. There may also be constant load torque if it is started on load and finally it requires torque J (d2 θ/dt2) to accelerate the rotor. It can be seen that as long as θ <π the synchronous torque acts in opposite direction to that of load torque which tends to reduce the angular velocity dθ/dtof the slip motion. When π< θ <2π then synchronizing torque acts in conjuction with load torque increase the slip i.e. nothing but angular vlocity dθ/dt and the motor fails to synchronize. As the slip motion is irregular, the motor is subjected to mechanical strains. Also there may be oscillations in current and power factor. Hence it is desired that the motor should be synchronize torque should be sufficiently larger than load torque and it should be opposite of load torque. The angle obtained at the instant of switching d.c. excitation also affects pulling into step. Following figures show oscillograms of rotor current on application of excitation for various values of θ. When the excitation is delayed beyond 60o it is seen that the rotor fails to synchronize as the induction motor torque and the synchronizing torque work in conjuction and the torque will be have pulsating value. Thus the motor can be pulled into the synchronism if excitation is applied at a position that the rotor will be occupy when both stator and rotor fields are synchronized. While studying the performance characteristics of synchronous induction motor, three different types of torques are to be considered. These are viz. the starting torque which indicates capacity of motor to start against load, pull in torque which indicates the ability of the motor to maintain operation during change over from induction motor to synchronous motor, pull out torque which represents the running of motor synchronously at peak load. The first two torques are closely related with each other and are the characteristics of the machine running as induction motor. The pull out torque is characteristics when it is running synchronously. 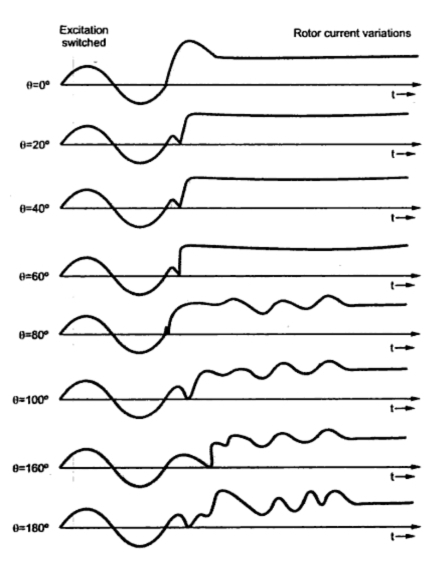 The characteristics curves for synchronous induction motor operating at full load unity p.f. and at 0.8 p.f. leading is shown in Fig. 3. When the load exceeds the synchronous pull out torque, the machine losses synchronism and runs as an induction motor which fluctuation in torque and slip due to d.c. excitation. With reduction in load torque the motor is automatically resynchronized. Following are the advantages of synchronous induction motor over salient pole synchronous motor. i) The synchronous induction motor can start and synchronize against more than full load torque which is not possible with salient pole synchronous motor which must be started against light load. ii) The exciter required for synchronous induction motor is of a smaller capacity as the gap is not long as compared to normal salient pole motor. iii) The rotor winding in synchronous induction motor can function as providing excitation and required damping. So no separate damper winding is required. iv) No separate starting and control equipments are required. i) As the gap is small as compared to normal salient pole synchronous motor it will not give large overload capacity. ii) The variation of power factor is large as compared to normal synchronous motor. iii) The speed variation is not possible for synchronous induction motor as it runs at constant motor. The application where mechanical load is to be driven alongwith phase advancing properties of synchronous motors are to be used then use of synchronous induction motor is better option. Also the application where in load torque is remaining nearly constant, this motor can be used.